Steel Cut Oatmeal with Cinnamon, Black Maca Powder, Maple Syrup, Chia Seeds, Strawberries, and Almond Milk. Coffee with Cream and Honey. Errands: Stopping by The Heritage to fill up my honey jar. Dropping off recyclables. Getting one pair of pants re-fixed at the tailor. Cleaning and organizing the storage unit. Grilled PB&J. Chia Corn Chips. Honey Green Tea. I mixed up my time slots for Music Makers and showed up late for my piano lessons, a rarity for sure. At the Great Neck Rec for adult basketball. Wrapping up my left ring finger. It doesn't seem to bother me too much nor does it affect my game play. I'd rather be burning calories on the court than on a treadmill. Back home. Fixing up my dinner to go: Spring Mix Salad with Tomatoes, Carrots, Chic Peas, and 9 Grains Dinner Rolls with Butter and Parmesan. Elliott scoops me up from the house. 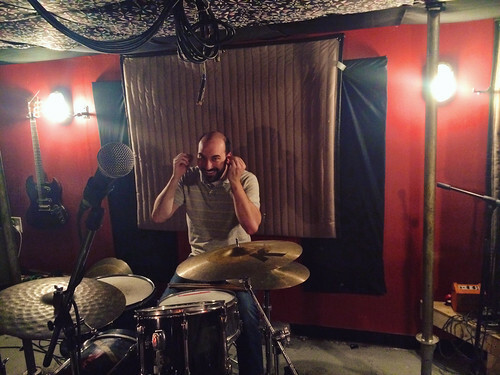 We pick up Joel near Rosemont and head out to Norfolk to have a You're Jovian band practice in a really cool basement designed specifically for bands to rent out. It's inspiring to see a customized music space like this. I'm jealous. I would like to build something like this one day in my own future house. Haven't played bass on these songs in a couple months but surprisingly it all comes together pretty easily. Back at the house. Feeding Elliott a dinner roll before he heads home. Installing a new metal shelf in the kitchen to organize the pots and pans.